I just came back from UPS Customer Centre in Camden. To be precise, the depot was right by Kentish Town Tube. I had to return the dog house I bought through Fab because Mr. B didn’t like it at all. A super helpful guy from Fab suggested that UPS could come & collect from my address if their depots weren’t in my neighbourhood. However, the damn UPS website was down. So I asked Hubbie to drive me there. This was what I ordered for Mr.B. Doesn’t it look fab? It was a love at first sight when I first laid my eyes on this cutie. 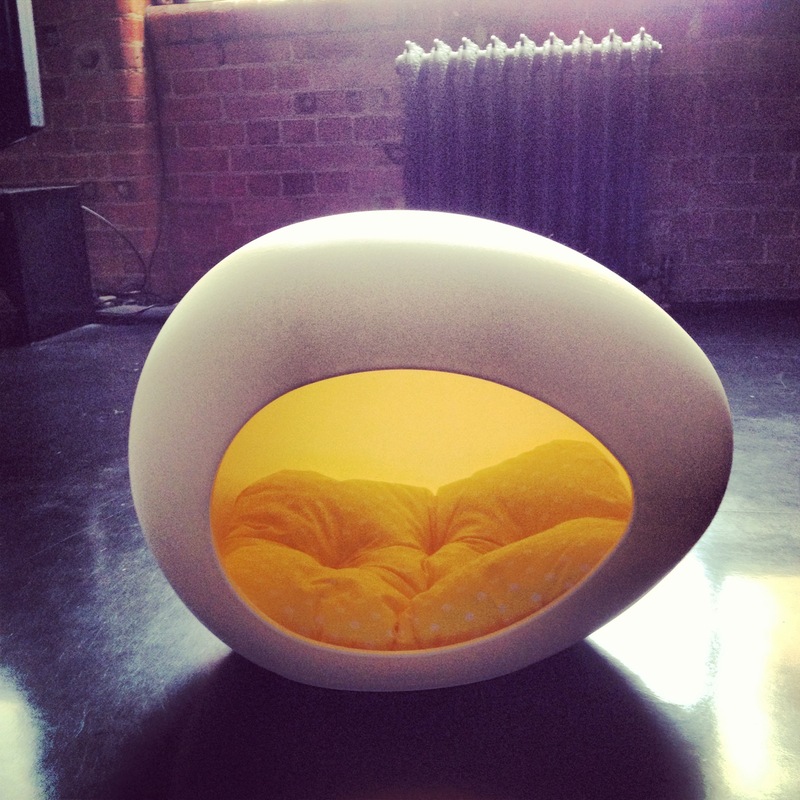 The shell is made of plastic and a yellow polka dot cushion accompanies it. Hubbie & I opened the package, getting very excited. How will Mr.B react to this unexpected gift? Our eager fingers couldn’t move any faster while peeling off layers of sticky tapes. Mr. B was observing it from his dog bed with a mild interest. And he approached the pod cautiously when our cheerful voice called him over. Then, something spooked him. He jerked himself out of the pod and retreated to his dog bed in a lightning speed! Oh no, what’s happened?! We tried really hard to lure him into the pod again. However, our effort was in vain. There was no way to bargain with or to reason with dogs if they have made up their mind. 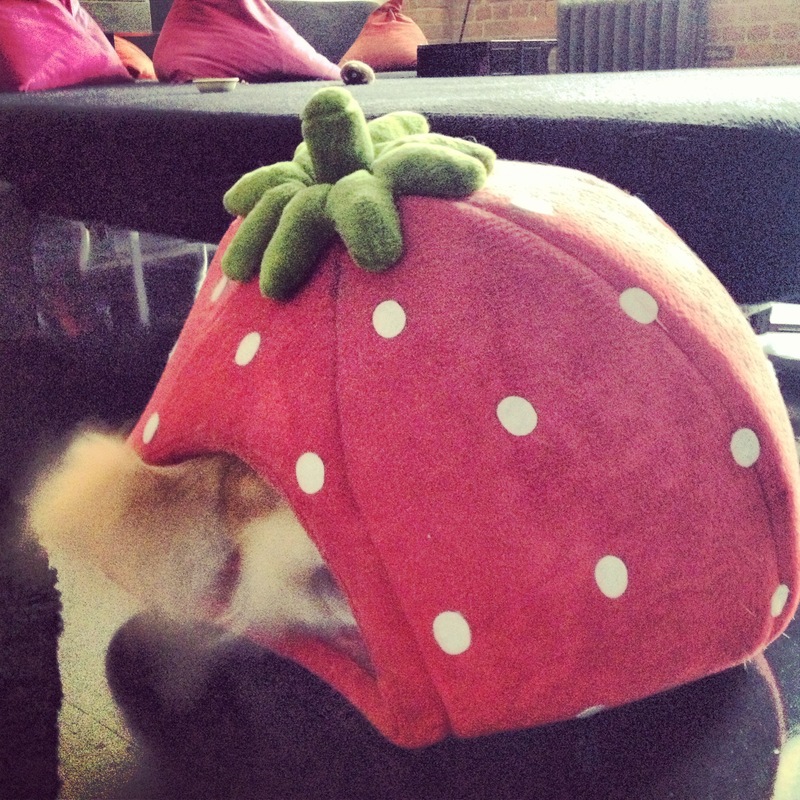 His crash pad, the Strawberry House, is aging so badly. It’s now lost all its freshness and is sagging like a rotting one. That was the original reason why I wanted to replace it in the first place. 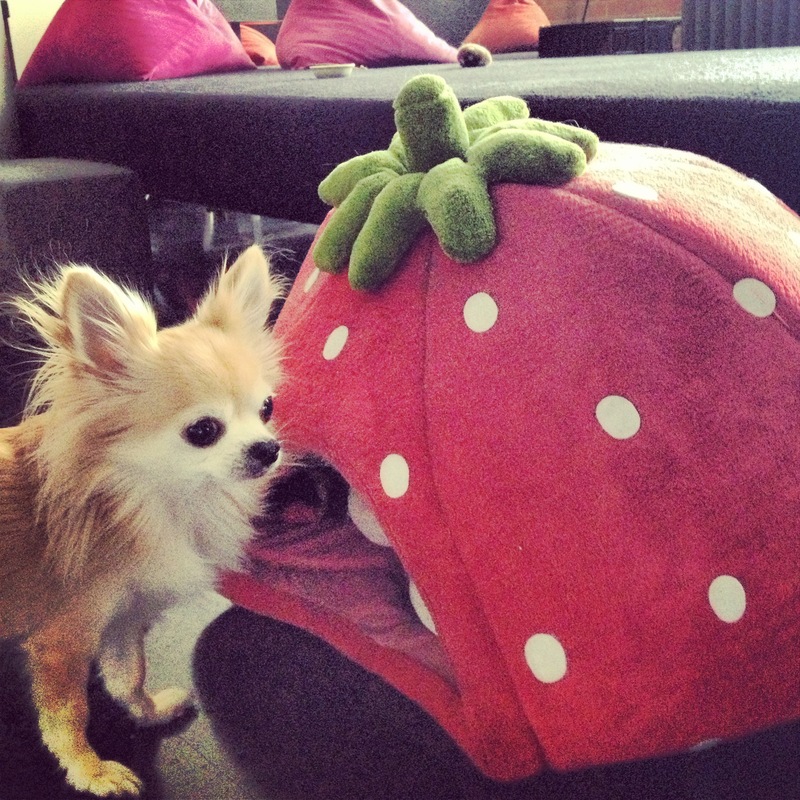 He is crawling back into his beloved Strawberry HQ before I change my mind. 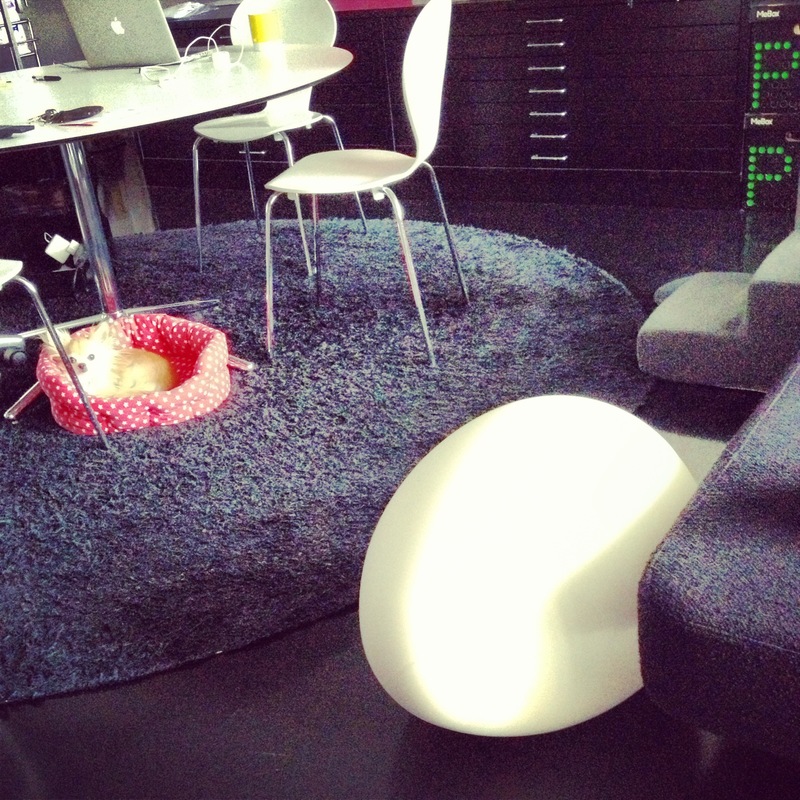 One of my lovely colleague just showed me your blog today and I could not believe what I saw! First of all, I am really sorry Mr.B did not like the egg, I do love it. I kind of had quite the same problem with my dog. But I could convince her to try the egg. After a test nap we agreed on this, I can have the egg standing in my bedroom as an eye catcher, if she can have her old bed in it. So it was a win-win situation for both of us. But the really funny thing is, that our dogs look alike, both are blond long hair Chihuahuas, and even more funny is the fact that we also both do have the Strawberry house. I really think that is so cool and a bit spooky. Hi Ytak, thank you for your comment. So you have a chi too! They are lovely, aren’t they? Mine is a little timid. So introducing new things is rather tricky. I wish if I could have done differently then when I showed hime the pod the first time.